A kelp forest in Monterey. 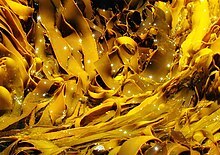 Kelp is a type of marine seaweed. It is a brown algae. There are many different kinds of kelp. Kelp grow in large forests, usually near the surface of the water. Some kelps grow very fast (up to 30 cm a day). Kelp can reach a length of up to 60 m. The blades are kept afloat by gas-filled bladders. Kelp plays an important role as food and habitat for fish and other forms. It may be eaten as a vegetable. This page was last changed on 15 December 2016, at 02:11.